When the Senate finally approved the MTA funding, our state’s less-than-august legislature did so with nary an air of finality. They do so more with the last sigh of someone fed up with the topic. For months — since February — the state legislature has dealt with transit issues on a near-daily basis. They have known for over a year that the MTA’s financial Doomsday would arrive in 2009, and they did nothing. While Gov. David Paterson solicited a Richard Ravitch-inspired plan that would have cut congestion while funding a transit renaissance in New York, our backwards legislature couldn’t stomach the costs of that plan. The State Legislature passed a series of new taxes and fees late Wednesday night meant to keep New York’s base subway fare from rising above $2.25 this year. But the hastily drafted bill, approved largely along party lines, raised many questions about how the plan would work and how effective it would be in stabilizing the struggling Metropolitan Transportation Authority. Questions also remained about the authority’s capital spending program, which is only partially financed in the rescue plan. The bill’s problems though are immediately evident. First are the economics behind it. The MTA is facing a deficit this year of $1.8 billion. Since the taxation and fee structure won’t be enacted until part of the way through 2009 though, the money may not be there to cover the whole deficit. According to reporters from Albany, the MTA will receive just $1.1 billion this year. Where the other $700 million will come from is up in the air. A recent move by the MTA Board to lengthen the agency’s fiscal year to 18 months may provide them with an opportunity in 2010 to balance the books this year. The answers though are hazy. Of additional concern are problems of collection. As the Daily News editorial board explained yesterday, no one knows how to collect this taxi surcharge. The Taxi and Limousine Commission has never enacted a city-wide fee of this nature, and considering the relatively loose and independent reporting procedures for cab fares, there is no simple system in place here. Beyond the short-term impact though are the long-term problems. As John Petro from the Drum Major Institute detailed in a short post entitled “MTA Rescue Spineless” and on SAS yesterday, Albany is again forcing the MTA to borrow to maintain a state of good repair and fund necessary upgrades and expansion plans. Petro is spot-on. The approach to transit in New York City is completely broken. We may have averted Doomsday today, but these issues will not go away until the state’s approach to transportation undergoes a massive reform. As long-time SAS reader Boris said earlier this week, “Even among New Yorkers there are many people who don’t think the subway can, or should, be better than it is. It’s all they know.” That attitude is a recipe for sub-par transit in a city aiming to keep up with smarter and better-equipped global competitors. In the eyes of the vast majority of New Yorkers, Gov. David Paterson will emerge as something of a transit savior this week. As the press has noted in detail, he brokered the the deal to save the MTA. He worked out a compromise among Assembly Speaker Sheldon Silver, State Senate Majority Leader Malcolm Smith and the Senate Democrats that guarantees around $2.2 billion a year to the MTA. It is a plan without bridge tolls and without much in the way of resources for the MTA’s capital needs. It is a plan that includes a payroll tax, a taxi charge and a slew of registration fees. It features a 10-percent fare hike this year and mandated hikes in 2011 and 2013. It also avoids Doomsday, and for that — for the simple act of getting something together months after a March 26 deadline — the politicians will pat themselves on the back. The plan will raise $1.5 billion a year from a payroll tax of 34 cents of every$100 dollars of payroll that will target all employers in the 12 counties that serve the MTA. The state will reimburse school districts for the payroll tax they contribute. $500 million will be raised from a 10 percent increase. Politicians had hoped to limit any fare increase to 8 percent. 85 million will be raised from a fifty-cent surcharge on taxi rides. The fee was reduced from the originally proposed $1. $130 million will be raised from a $25 fee on vehicle registrations in the 12-county MTA region. $35 million will be raised from an increase of the fee on car rentals. $10.5 million will come from an increase on the fee on driver’s licenses. And thus, as long as the economy doesn’t continue to nose dive, as long as payrolls stay steady, as long as taxi rides stay constant and driver’s licensing and car registration numbers do not dip, the MTA won’t have to worry about that pesky multi-billion-dollar budget gap. On the fare front, details are still sketchy. We’ll know more once the MTA releases its official figures later this week. William Neuman and Nicholas Confessiore have some preliminary numbers. The base fare will increase from $2.00 to $2.25 and a 30-day unlimited ride MetroCard will cost around $89, up from $81 but a far cry from Doomsday’s $103 price tag. Fares are also set to rise by 7.5 percent in 2011 and 2013 to match cost-of-living increases.. The problem of course is that final phrase. It’s “enough to get a start on the capital plan,” and it’s enough to set the MTA back on a course of building through borrowing. I guess we should be thankful the capital plan was given any consideration. Earlier this week, as Streetsblog noted on Monday, Paterson had removed capital funding from the rescue plan after a weekend tirade from Sheldon Silver. Facing pressure from transit advocates and editorials from The Post, The Daily News and The Times, the politicians caved. While the legislature will probably vote later today to approve this funding package, the work of the transit advocates is just beginning. As this debate has shown, New Yorkers are woefully uneducated on transit issues, and politicians aren’t helping the cause. The MTA needed to avoid this Doomsday, but it also needs the other half of the Ravitch Report — long-term capital investments and system-wide improvements. We can’t rest until that day arrives. The final two pieces of the Democratic puzzle have fallen into place. After closed-door meetings in Albany on Monday, the final two Democratic holdouts in the State Senate — Craig M. Johnson and Brian X. Foley, both of Long Island — have agreed to support the latest iteration of the MTA funding plan. This plan, according to reports, will generate approximately $1.7 billion in revenue for the beleaguered MTA. It culls this money from a small payroll tax in the counties in and around New York City that receive MTA service, a 50-cent taxi drop-off surcharge and higher fees for car registration and driver’s licenses. The senators said they were swayed by a commitment from Gov. David A. Paterson to reimburse school districts for the cost of a payroll tax that is the centerpiece of the rescue plan. Mr. Johnson and Mr. Foley said, however, that their support was contingent on the final wording of the rescue legislation, which is still being negotiated. Without this funding plan in place, the MTA is prepared to enact a Doomsday budget scenario. Service across the city will be scaled back or eliminated, and the fares will skyrocket by nearly 25 percent. Our precious 30-day Unlimited Ride MetroCards would cost $103. As The Daily News’ Glenn Blain and Pete Donohue note though, the Senate plan will roll back those hikes and cuts. According to the two reporters, the MTA will increase the base fare to $2.25 instead of $2.50, and monthly MetroCards will cost $88. Meanwhile, the MTA will be able to mainatin the bus and subway routes scheduled for elimination, and service can remain at current levels. For now, this is something of a victory for transit advocates. The state is, pending passage of this bill, finally providing for a dedicate source of revenue for the MTA. This is not just a one-year stop-gap measure. This payroll tax and taxi surcharge will remain in place in perpetuity. However, all is not well with the MTA and this plan. As it stands right now, this plan will generate around $1.76 billion for the transit system. With a projected deficit this year of $1.8 billion and a projected deficit of over $2 billion for 2010, this new money will be just enough for the MTA to get by. I’ll examine the capital funding issues later today, but prospects are hazy, at best, for the MTA’s state of good repair program and its expansion plans. Politically, for now, this move will reassure the voting public in New York that the State Senate is keeping an eye on transit. I don’t really trust that eye, and I don’t really see our legislature dedicated to a long-term solution. Today, though, Doomsday is one step closer to being one step further away. Gov. David Paterson knows he doesn’t have a ground-breaking plan to fund the MTA on tap. In fact, he is willing to admit that his plan is simply a stop-gap measure designed to halt a fare hike and avoid crushing service cuts, and he said as much this weekend. But while his plan doesn’t accomplish the long-term funding goals of the Ravitch Plan, Paterson wants a quick resolution to this MTA fiasco in Albany. After all, in four weeks, the MTA is set to raise fares throughout the system, and the transportation authority plans to begin rolling out the service cuts a few days later. Reportedly, Paterson has convinced Sheldon Silver and Malcolm Smith to help him, and if Smith and Silver can deliver the Senate and Assembly respectively, some sort of funding plan will fall into place. Right now, though, the issue focuses around the four Democratic State Senators who have refused to support any plan with a payroll tax. Prior to this week, two Westchester Democrats and two Long Island Democrats refused to join their party in supporting a funding plan, but after Paterson introduced his school rebate plan, the Westchester Dems — Suzi Oppenheimer and Andrew Stewart-Cousins — moved back into the yea column. Senators Craig M. Johnson and Brian X. Foley remain opposed and are considering holding up the bill. Paterson may face another potential obstacle in his school plan from the Assembly. Sheldon Silver, Assembly speaker, has raised concerns over the plan because he doesn’t want to see non-profit organizations and government agencies searching for tax refunds as a rule. Sheldon could still have the Assembly push his modified Ravitch Plan, forcing a conference meeting over the Senate’s and Assembly’s dueling bills. Meanwhile, for all of this talk of a quick resolution, a few issues remain. First, the MTA is now facing an additional $600 million deficit, and it’s unclear if Paterson’s plan addresses this new hole. It’s also unclear if Paterson’s plan will fund future deficits, and we know unequivocally that his plan does not fund the capital budget. Despite its current operations problems, for the MTA to remain competitive and to offer New Yorkers a top transit systen, that capital plan needs to be funded. In the end, Paterson is relying on his quick fix to restore both some semblance of economic order to the MTA and some of his long-gone political capital. If he can stave off the fare hikes and service cuts, he says, he’ll push the legislature to find money for the five-year capital plan later this year. Not only then is the politicking far from over, but the battle over the future of the MTA has really just begun. David Paterson has a secret plan for the MTA. After debuting this fact on Wednesday, Paterson spent all day on Thursday talking about it. “They are reviewing it with their members. If it passes muster, we’ll make sure you know about it soon enough and hopefully vote on it as soon as when we get back. And I would like the day to be Monday,” Paterson said to NY1’s Bobby Cuza on Thursday. So with all of this secrecy surrounding Paterson’s plan, it better be a good one, right? Well, William Neuman and Nicholas Confessore of The Times spoke to a few sources in the know, and the plan sounds like nothing too secretive. Unless the two reporters failed to uncover something, this super-secret, Save-the-MTA plan focuses around — get this — refunding the schools impacted by the payroll tax. Seeking to break a stalemate on a rescue plan for the Metropolitan Transportation Authority, Gov. David A. Paterson made a secret proposal this week to have the state give money to school districts to cover the cost of a new payroll tax, according to people briefed on the proposal. They said that the school proposal was what Mr. Paterson was referring to on Wednesday when he said that he had a “new idea” to move the stalled authority bailout forward. The governor has not said publicly what the new idea is. Officials said that he discussed it with the Senate majority leader, Malcolm A. Smith, and Assembly Speaker Sheldon Silver on Wednesday. The payroll tax would provide about $1.5 billion to the authority each year, but four suburban Senate Democrats have opposed it, in part because they said it would burden school districts, which would have to pay the tax. Meanwhile, the four Democrats whose votes are required for any MTA funding plan and how have vowed to block any payroll tax may not even support this plan. It could be another D.O.A. funding plan for the MTA. Now, David Paterson is in a precarious position. He wants to reelection, but his popularity rankings are so low that he probably wouldn’t even defeat a Democratic primary challenger. By publicly hitching his wagon to this plan — and promoting it as his compromise to save the MTA — he’s playing a dangerous political game. If this is all he’s got, he’s going to lose. Embattled New York State Governor David Paterson has a plan for the MTA. What it is though is anyone’s guess. Paterson, speaking yesterday in Albany, shared some cryptic words with reporters. Right now, the governor has let slip nary a word about his plans, but he has been telling people some “enhancements” for the Senate. New York City is covered in subway stations. There are, in fact, 468 of them, and not one of them was designed to be closed overnight. Some are designed for reduced capacity late at night; some are designed to have fewer entrances open; but no matter the hour, a subway will eventually stop at every single station in the system. Now, though, Elliot Sander, executive director and CEO of the MTA, is threatening to take it all away. Faced with a crushing deficit nearly 50 percent beyond what officials first projected, the MTA is facing a second Doomsday this year. Without a major funding plan from Albany, the MTA is going to have to raise fares and cut services for an unprecedented second time in one calendar year, and no one is looking forward to it. During a Wednesday board meeting in which the MTA brass gave the go-ahead to its finance committee to draw up an 18-month plan that could be approved as early as June, Sander sounded a dire tone. “I’m not sure the English language captures what goes beyond doomsday but to me, as a transit professional, as a citizen and a user of the system, they are just unbelievably difficult and I think some would view them as horrific,” he said said. Horrific as in no more 24-hour service. He said that he had not discussed an overnight shutdown with the president of New York City Transit, Howard H. Roberts Jr., and that there were strong arguments for maintaining all-night service. A transportation authority spokesman, Jeremy Soffin, later clarified those remarks, saying, “We are not actively studying a nighttime shutdown of the system.” He said running fewer trains at night was a more likely option. It all comes back to those 468 stations. The system simply wasn’t designed to stop. There’s nowhere to store all of the rolling stock; the cost of securing the system would be immense; and the cost in labor or time in shutting down and starting up the system basically negates — and is generally believed to outweigh — the cost savings of a shut down. Of course, that’s hardly good news. The MTA can roll back subway service to two trains an hour on nearly every line from 2 a.m. to, say, 5 a.m. It doesn’t even need to add complementary Night Owl bus service. It will make taxis a more alluring alternative and will add significant time to off-hours workers’ commutes. In other words, it’s a second Doomsday. “I want to wake up in the city that never sleeps,” Frank Sinatra croons in his classic rendition of “New York, New York.” The subways are in fact the main reason why this city never sleeps, and to take away the late-night subway rides would be to rob the city of its vitality, its allure and its 24-hour-ness. It makes for a dire Doomsday threat, but it won’t happen. At least we have that silver lining in this dark grey cloud. 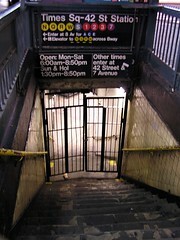 Photo of a closed subway station by flickr user A30_Tsitika. Due to a procedural rule in the New York State Senate, any Senate-endorsed MTA funding plan will not come to a vote until next week at the earliest. Meanwhile, Albany-watchers still do not believe that Senate Majority Leader Malcolm Smith has the requisite 32 votes to pass any sort of bill, and the MTA is counting down the days until it must unveil 2009’s second fare hike plan. Tuesday in Albany started with some minor amendments the MTA funding plan approved Monday by the Senate’s transportation committee. The bill, approved along a 10-8 party-line vote, contained a few mistakes that had to be rectified, but because the Senate demands a three-day ripening period for legislation, the bill won’t come up for a vote again until Monday. According to Elizabeth Benjamin (linked above), the changes were mostly cosmetic. The taxi cab drop-off charge now applies to yellow cars only, and the language requiring a mandatory MTA audit was strengthened to “shall be” from “may be.” No matter the langauge, Newsday’s James T. Madore can’t find 32 Senators in favor of the bill. Downstate, Mayor Bloomberg finally ramped up his campaigning for the MTA. Bloomberg, along with teacher’s union head Randi Weingarten and President and CEO of Parntership for New York Kathryn Wylde, sent a letter to the state’s leaders in Albany urging support for the beleaguered transit agency. Meanwhile, Newsday’s editorial board just wants Albany to allocate its discretionary funds to the agency. “Is nobody willing to argue that maintaining subways, buses and trains is a basic governmental responsibility?” the paper asks. All of this Doomsday politicking leads to one overarching bit of bad news: While I yesterday said that the MTA would have to enact a second fare hike by the fall, amNew York’s Heather Haddon says that the MTA could unveil a second fare hike as early as May if the Senate does not act. Further we go along the downward spiral. While time has long run out on the MTA, a group of transit advocates are going to give it the old college try today. This evening, from 5:30-7:30 p.m., three groups will be hosting a rally in Union Square to “urge our elected officials to stand up for transit.” The Straphangers Campaign, the Working Families Party and Transportation Alternatives will gather to “send a clear message that New Yorkers are united against the 25% fare increases and service cuts.” That’s all well and good, but as Streetsblog’s Ben Fried wrote yesterday, until these groups — and in particuarl, the WFP — come out for something, they’re just spinning their wheels. As a current law student with a background in American history and political science, I’m more than a little dismayed about the recent news coming out of Albany. According to numerous reports, Senate and Assembly leaders no longer really care about the substance of any MTA funding plans. Rather, our elected officials tasked with representing the city’s and state’s interests are going to support any plan as long as it has the requisite number of votes. If that isn’t a total derogation of political responsibility, I don’t really know what is. “It’s not about merit, it’s just about what gets us there with the votes that we need to get it passed,” Senate Majority Leader Malcolm Smith said late on Monday. Smith was not alone in these sentiments. “I can support a bill that has 32 votes in the Senate that we can look at seriously,” Assembly Speaker Sheldon Silver said, echoing Smith’s committment to, well, anything. Albany started down the path to this sad state of affairs early on Monday. As the MTA Finance Committee sat through a presentation on the agencie’s ever-increasing deficit, the Senate Transportation Committee reiterated their opposition to the taxi surcharge plan. In fact, when the dust settled, Albany watchers were prepared to call the latest proposal dead on arrival. With strident opposition from the state’s leaders, it’s unclear if Smith can round up 32 votes to support a plan that he admits is lacking on the merits. The day ended with a closed-door meeting between Smith and Assembly Speaker Sheldon Silver. This meeting yielded nothing but more bad blood between Democrats and Republicans as the two legislative chambers continue to search for adequate funding measures. The problem here — fairly obvious to transit experts — is that what will pass is not what will save the MTA from further fiscal problems. For years, the MTA hasn’t received proper state and city support, and these plans the Senate is currently debating are stop-gap measures aimed at closing a budget gap. They aren’t forward-looking plans that would discourage driving in New York City, encourage transit use and provide a steady revenue stream for a fully-funded MTA. No matter what happens, no matter what plan 32 Senators eventually agree upon, it won’t be good enough, and that is a failure of New York State politics.